Canon recently updated their popular Cinema EOS C100 and EOS C300 cameras to feature Dual Pixel CMOS AF Technology. Now they are offering two unique kits for each model. The C100 kit pairs the camera with an Atomos Ninja 2 monitor/recorder, while the C300 kit adds Zacuto accessories to give the camera an ENG-style design. The C100 kit includes the camera body, 24-105mm f/4L lens, and an Atomos Ninja 2 external monitor/recorder to take advantage of the camera’s uncompressed 1080p 8-bit 4:2:2 HDMI output. The Ninja 2 then gives you the option of recording that signal in 10-bit Apple ProRes LT, 422, or HQ codecs to an included 240GB SanDisk Extreme SSD. An HDMI cable and an articulating arm for attaching the Ninja 2 to the C100 round out the kit. 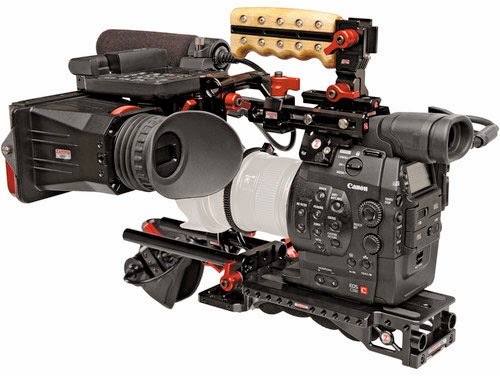 The new Canon C300 EF-mount kit is designed to provide a complete shoulder-mounted shooting solution by outfitting the camera with Zacuto accessories. The first accessory is the C300/500 Helmet and Coldshoe Handle Kit, which screws into the top of the camera and provides additional threaded accessory holes and a wooden top handle. The next accessory is Zacuto’s Z-Finder for the C300/500, which slides over the camera’s LCD screen, turning it into an electronic viewfinder. To better position the monitor for shoulder-mounted use, the Z-Finder comes with a mounting kit for attaching to the Helmet. To place the camera on your shoulder, Zacuto’s VCT Universal Baseplate is provided, featuring a cushioned shoulder pad and 15mm rods to support additional accessories. Completing the kit is a Grip Relocator, which lets you mount the C300’s grip on the baseplate’s 15mm rods for comfortable handling and camera control. Canon Japan Rethinks Its Pricing Strategy? Canon MegaPixel Camera Coming In 2015?